I was planning on writing this article on the morning of June 2nd while I was at the airport on my way back from the largest Magic: the Gathering tournament in history. Unfortunately, I realized upon opening my Chromebook that I had forgotten to charge it. Damn. That leaves me scrambling to come up with a succinct way to pack the events of this week into a short finance-centered column, in only a few hours. I actually took my finger off the pulse of the finance machine during my time in the desert so that I could play more Magic in one week than I had done in the past year and a half, but I reluctantly managed to pick up some information that I’ll spill out through this column in separate little topics. Now that the 1970s are firmly behind us, can we stop labeling every slightly controversial issue in any community ever with the suffix “-gate”? If you haven’t heard the news, I’ll do my best to quickly fill you in on why that particular Tarmogoyf is being auctioned off for ridiculous amounts of money (Unfortunately at this point, the auction is likely being ruined by fake bidders who have no plans on paying the number). 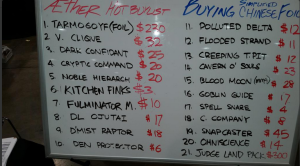 After Pascal Maynard rare-drafted a foil ‘Goyf in the Top 8 of the Grand Prix, several other well-respected names in the community lost respect for him and felt that he had damaged the competitive integrity of the game, copping out for a theoretical $300 bill over the Burst Lightning that was obviously the better pick for his deck. Everyone has their own personal struggles and situations that they’re dealing with in life, and it was later revealed that Maynard would likely be selling the Goyf in an auction on eBay in order to pay for future Grand Prix trips. The really cool part about this is that Maynard is donating 50% of the proceeds to a charity that holds dear to my heart personally, called GamersHelpingGamers. It’s a group of people who have been playing Magic for almost as long as I’ve been alive, who have been giving out scholarships with donations to Magic players who are trying to afford college. I received one of their first scholarships back in 2012, and I try to encourage everyone I know to apply. If you’re in college (or planning on attending college in the next few years), here’s a Magic finance tip above almost all others: Have foil Tarmogoyfs and the likeness of Dark Confidant help you pay for your college degree instead of selling your collection to do so. This foil Goyf from Maynard’s pile of 45 cards is special for more than just the story of being picked. It also has the GP stamp that the judges used to mark the cards, to prevent any additional unwanted cards from joining the pool. While a majority of vendors and sellers would consider the mark as a damaging aspect of the card, there is definitely a niche market out there who collect the stamped product for use in cubes and EDH decks. Foils are the big targets here; Although I’m not suggesting you should start grabbing foil Simic Initiates to make your Day 2 draft pool a bit more attractive to a niche market, maybe that’s what I should have done considering how bad I am at Limited. I wouldn’t go hunting down stamped foils in order to speculate on a big spike, but if you have a choice between a foil cube playable card and a non-foil ten cent Vampire Lacerator for your UR Elemental deck… it’s definitely worth picking up and finding the person who wants to pay extra. Although there were a few hiccups with side events starting late on Thursday and Friday, the Grand Prix as a whole was overwhelmingly smoothly run. 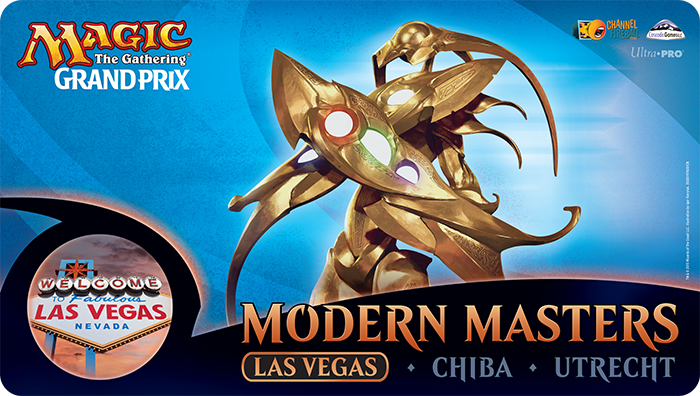 Product was distributed at a reasonable pace, players didn’t have to wait in a two hour line to acquire their promos or playmats, and Day 1 ended by 10:00pm local time, making sure there was enough time to get sleep for the draft the following day. One of the key aspects of making sure the product was moved from the judges to the players quickly was packaging playmats, life counters, promo packets, pens, packs, and deck registration sheets inside the 800-count long boxes that I talked about last week, so that every single person in the room had an easily accessible container of all their GP swag. It was easy to tell if someone hadn’t received their box of products, and everything was kept neat and clean. If you’ll remember to last week, I was complaining about the price increase from BCW Supplies on the boxes that I regularly ordered. As I traversed the floor of the event, I watched hundreds and hundreds of people throw away their boxes into the garbage. I didn’t bring a large enough backpack to fold them up and take them with me, and I sure as hell didn’t have the room to take them back on the plane with me, even unfolded. Maybe I’m being a bit too frugal here. but I would have loved to collect as many boxes as possible from those who weren’t using them, and bring them back by the hundred to my house if the GP had been local. I would have saved so much money, and I had to just watch my potential deals get thrown away. If ChannelFireball continues this method of product distribution (or if another vendor smartens up and decides to use the idea for themselves), you might be able to cash in on some cheap or free card storage if you brought the space to move a large quantity of boxes. At some point over the weekend, someone decided to buy out all of the copies of Omniscience off of TCGplayer and eBay. While I have no idea how many copies there actually were before the buyout or how much money it cost the person to do it, the cheapest available copy I can find right now is $30, several days after the spike. 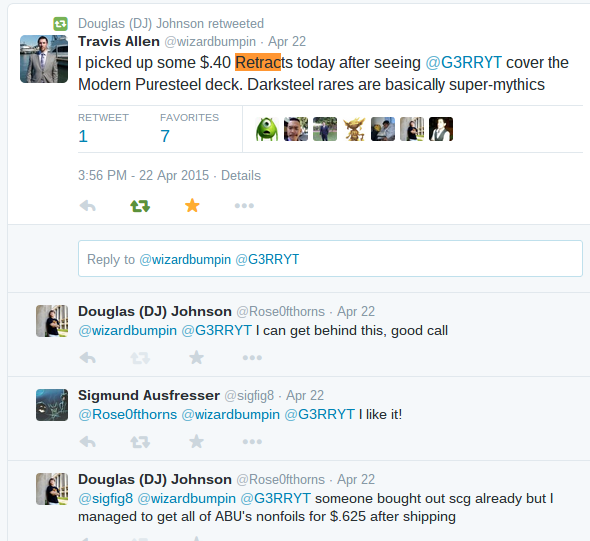 Aether Games’ Goyf buy prices were the talk of the town over the weekend, but they were also extremely aggressive on a significant other number of staples, targeting cards that were safe from a reprint anytime soon and poised to go up. 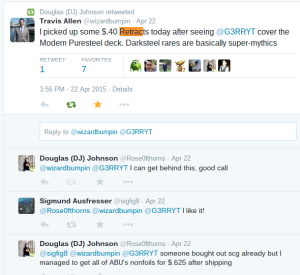 They were paying retail prices on Creeping Tar Pit, Omniscience, and other staples that would continue to go up in price due to their exclusion from MM2015. 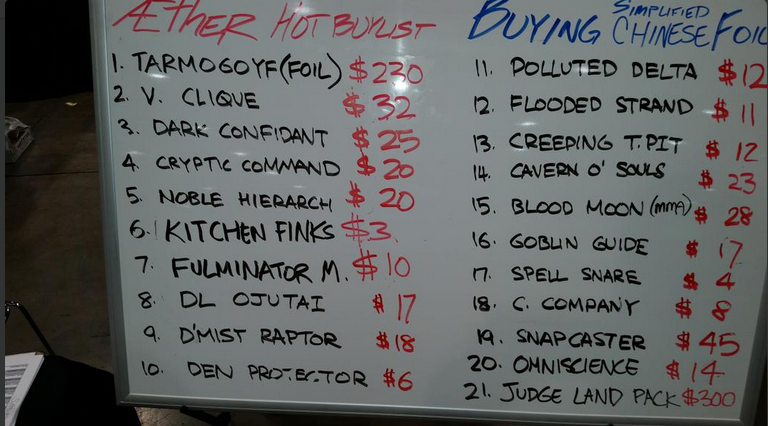 If you’re on the floor at the next GP that Aether is vending, I recommend snapping a picture of their hot list and using it as a guide for trades, as an easy way to turn cards into cash for full retail, or hold onto the cards on their list in hopes for a steady increase. Personally, I’d be selling them all of my Deathmist Raptors, but joining them on the Cavern of Souls and Tar Pit bandwagon. While buylist prices haven’t caught up to the hype, now is your time to get out if you like locking in profits, or holding if you’re more of a risk-taker and expect more of the deck. Remember that Amulet of Vigor spiked several times over the course of a couple years, every time it saw coverage at a large Modern event. If you bought in at the floor with Travis and I, you might want to hold off a bit and see if you can sell into another hype wave later on. Either way, I definitely don’t think buying in now at $2-3 is the correct answer. Normally I have some sort of coherent theme throughout the article, and this is where I add in random tid-bits of information about what happened last week, where to plan for next week/month/year, or something to that effect. Considering I spent an entire week’s article on one giant “End Step,” I’d like to instead open the floor to do some sort of mailbag article, or “Ask me Anything” style article, where I take questions from readers and provide in depth answers as to what I would do in your situation. If you would like to have your question answered, please provide at least some degree of context. Letting me know what type of player you are, how often you play, what your usual methods of acquiring and moving cards are, and what your goals are in Magic can help me answer your question more thoroughly. Questions can be sent to my email at djohnso5@oswego.edu, or hit me up on Twitter if you can somehow pose it in 140 characters or less. Thanks for reading, and I’ll see you next week! I outed 4 of my foil retracts for a happy price (to me). $25 a pop basically, sold as a playset. I couldn’t find more foils a month ago when I was buying them unfortunately, or I’d have a lot more to sell. I’ve played the deck, it is super fragile, but can almost always pull off game 1 without a problem unless you have to mulligan multiple times with a terrible hand, or somehow can’t find your combo piece and exile > 15-20 cards with spoils of the vault (or exile all 4 copies with demonic consultation if you’re playing legacy). Jeez, $25 each is really nice. I would love to even get $1.50 for my nonfoils, because I paid around $.50 each after fees and shipping. Wait, what? Retract spiked? Why doesn’t this happen here in Europe, too 🙁 I have multiple playsets. You can get it at about 0,20€ a copy consistently here. Because the people who buy out TCGplayer and eBay don’t think to buy out MagicCardMarket as well. Lol that is Alex Bertoncini’s want list from facebook. Love it! I’m going to have to think about a topic I would like to ask you about for that “mailbag” article. Great Idea! I’ll see if I can put something together worth asking and email it to you. Thanks for the lengthy reply, I’ll try to answer in as much detail as possible! Here’s a quick mailbag topic for you although it probably doesn’t need a long answer or article: With Battle of Zendikar on the horizon will Wizards print new Eldrazi to replace/surpass the originals in power? Most importantly, is Emrakul (now reprinted) still going to be the king of Show and Tell or will there be a new monster that makes Emrakul obsolete? You can also touch on the following: will the enemy fetches be reprinted (answer “yes” lol) and will cards like goblin guide and spell pierce see a reprint? Will Full Art Basic lands be printed/reprinted and what will NEW Full Art Basics (foil and non-foil) do to the price of the originals? I’ll certainly throw in my opinion on the BFZ potential reprints next week, but it’s important to note that my opinion as someone who is more focused on the finance side of the game doesn’t matter any more than yours, or anyone else’s. Predicting what’s coming up in the next block, what cards will return, how many mechanics will be tweaked/brought back, etc, is basically a 50/50 guessing game. I have a recommendation on a future article. If there was more information for the players who are on the path toward becoming fiscally responsible with the game but haven’t been summerged in the finance side long, then the writes could help perpetuate and develop the mtg finance culture. It is an easy way to support the players / investors while insuring that future collectors feel confident expanding on the hobby; I.e. confidence in trying new things like going to said events.